The Escapist is one of those games where they don’t give you the exact address on the website. While that can add a bit of intrigue to the experience, it does mean that, if you’ve not paid proper attention, you’re left frantically searching through email for exactly what you’re meant to do when you get there. On the plus side, that also reminded me that there was some backstory as to who we were and what we were there for. Phew. Once inside, you’ll find your way to a makeshift bar, where Alfie gives you the introduction. It’s given entirely in character and on theme, including warning you not to use too much force or take photos – an impressive achievement. 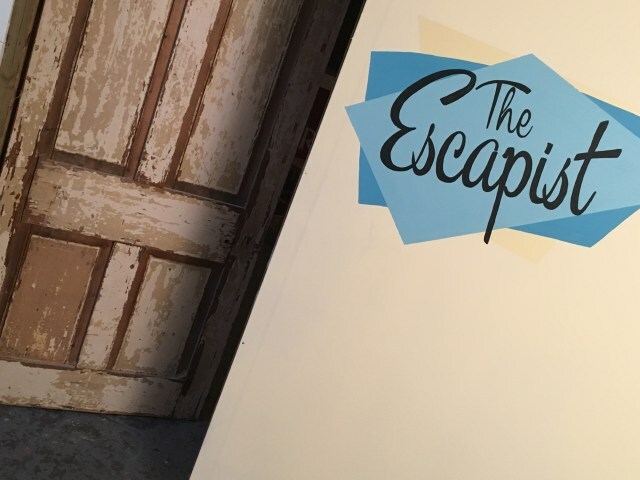 Your eerie escape adventure brings you to a once bustling underground bar called ‘The Escapist’ which is run by Lavinia Carter, a leading figure of the New Cross and Deptford arts scene in South-East London. Strange happenings and mysterious disappearances have been connected with the bar and now Lavinia herself seems to have gone missing. Lavinia does have a habit of taking impromptu trips but something seems different this time. Has her interest in her late grandfather got anything to do with her recent disappearance? Or will she turn up on the backpacker trail sipping a margarita? It’s time to meet with mutual long-term friend Alfie who is looking after the bar while she’s away. Can you figure out what’s been going on? Or were we? I’m not really sure where you would technically say the intro stops and the game begins. In truth, it doesn’t really matter, and what they’ve achieved here is the unusual feat of making the entrance to the game reasonably natural. There’s no “when the door closes, your game begins” to break the immersion and, while that means you may not know exactly how much time you’ve got, it’s a better experience for it. The game has a very temporary feeling about it. Decoration is fairly minimal and I didn’t feel there had been a huge amount of investment in the space. The story lent itself to that slightly – we were meeting in an underground bar – so you wouldn’t expect it to be too well appointed, but this felt very bare. If you’re looking for depth or breadth of puzzles, then I think you’ll be disappointed. There were a few basic physical ones, although nothing that will get enthusiasts massively excited. The one exception was a slightly more involved puzzle used in the finale which wove together a few strands of logic and then had a solution which matched well with the theme. Elsewhere, riddles abounded and, while I could see how that fitted with the story and gave a natural reason for puzzles to exist in the game world, it felt like it was overused. In the event you need clues during the game, you’ll find that there’s a slightly unusual mechanism for offering help that fits about as well within the game world as you could hope. Clues were offered when the GM felt we needed them and their timing and level was judged well. The end of the game was a mixed affair, with highs and lows in equal amounts. Perhaps I’m being a little too needy but I wanted more closure to the story and was left feeling like I’d only been given the briefest hints as to what had happened. I really wanted to know more of the whys. On the plus side, it was a theatrical ending that built up the tension and gave you a very clear ending to the game which saw us bundling out of the door. We escaped in just under 40 minutes having received two clues. The Escapist was an interesting game which ultimately, for me, didn’t hit the mark but came close. It focused on telling a story, but I don’t feel like I really understood what that story was. It felt that we hadn’t solved many puzzles but, having thought back over the game, it was more that the puzzles weren’t very exciting. The backdrop to the game felt rough and ready, but I got the feeling that was more because of a limited budget than a lack of ability on the part of the designer. There was an attempt to create a strong atmosphere, and that worked well in places. We left the room with more questions than answers. Is it worth going? I think so. Beginners will have a great time, not noticing the weaknesses at all. If you’re more experienced, then focus on those strengths and you’ll leave having had fun. We headed over to the White Hart – a local pub recommended by Modern Fables which was the perfect relaxed environment for a post-game discussion with good burgers and, I’m told, beer to refuel.